Dubai, 19th of May, 2016: The First Group has appointed Millennium & Copthorne to manage its stylish new hotel in Dubai’s thriving Jumeirah Village Triangle (JVT) district. The landmark deal was inked today at an official signing ceremony attended by Rob Burns, Chief Operating Officer, The First Group, and Ali Hamad Lakhraim Alzaabi, President & CEO of Millennium & Copthorne, Middle East and Africa (MEA). The newly-forged partnership will see the international hospitality group manage Millennium Place JVT Dubai, a contemporary four-star deluxe property that is scheduled to open in 2019. A striking 34 storey glass-clad building with a sizeable inventory of 599 guest rooms, The First Group’s latest hotel venture is located in one of Dubai’s most sought-after commercial and residential communities, close to several major landmarks and attractions. These include the upcoming World Expo 2020 site in Dubai South, designed to cater to 25 million event goers, as well as Dubai’s new mega aviation hub, Al Maktoum International Airport, which when fully operational, will have the capacity for more than 220 million passengers annually. Dubai International Airport is also easily accessible from JVT via Al Khail Road, as are popular shopping destinations such as Dubai Mall and Mall of the Emirates, while the brand new and hotly-anticipated Al Khail Avenue Mall development, due to open in 2018, is virtually on the doorstep of the new hotel. Millennium Place JVT Dubai has been designed with business and leisure guests in mind, with stand-out facilities including two specialty restaurants, a spa, business centre, and a luxurious rooftop clubhouse with swimming pool, gym, steam rooms and a sundeck. The hotel property will also offer a suite of services including valet parking, concierge, 24-hour room service, laundry and dry cleaning, a travel booking desk, Wi-Fi and broadband access and a smart-card access system. Millennium Place JVT Dubai is The First Group’s third dedicated hotel development in Dubai, with other projects located in Dubai Marina and Jumeirah Village Circle (JVC). “Millennium Place JVT Dubai marks another major milestone for The First Group, as we continue to grow our portfolio of hotel properties across the city,” said Danny Lubert, the company’s co-founder and joint chairman. 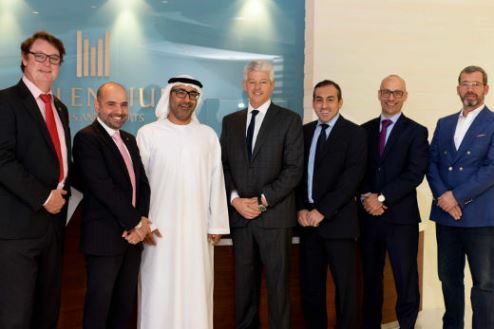 The signing strengthens Millennium & Copthorne’s rapidly expanding portfolio in the UAE, cementing its position as one of the fastest growing operators in the region. Ali Hamad Lakhraim Alzaabi, President & CEO of Millennium & Copthorne, Middle East and Africa (MEA) added: “Millennium Place JVT Dubai will be an exciting addition to our regional portfolio, which we aim to grow to 100 properties strong by 2020.